Manufacturing's share in the country's GDP has fallen in recent years and it will take more than a marketing campaign to turn India into a manufacturing powerhouse. Can India become a manufacturing powerhouse? Six months is a long time. It is nearly the time a trip to Mars would take, according to Mars One, a not-for-profit foundation that seeks to establish a permanent human settlement on the planet whose average distance from the Earth is 225 million km. It is also the time a 1,622-km-long road journey in India could take. Two years ago, heavy engineering company ISGEC was transporting three consignments of column - process equipment weighing between 53 metric tonnes and 158 metric tonnes, and six meters high - from its factory in Gujarat's Dahej to the Jindal Steel & Power plant in Angul, Odisha. Along the way, the company faced three railway shutdowns, made five detours where roads were being built, trimmed 100 trees after local permissions because of the column's height, and removed and reinstated 200 overhead power cables. It also paid off villagers a dozen times to allow the consignment to pass, and its drivers and supervisors were manhandled 13 times. The road barely existed in the last 100 km. The equipment was delivered in 180 days. This journey tells the tale of making in India - manufacturers everyday face headwinds due to poor infrastructure, lack of environment clearances, local trouble, and slow decision making. Add labour trouble, land issues and taxation bottlenecks and you have a sector that is deep in the woods. 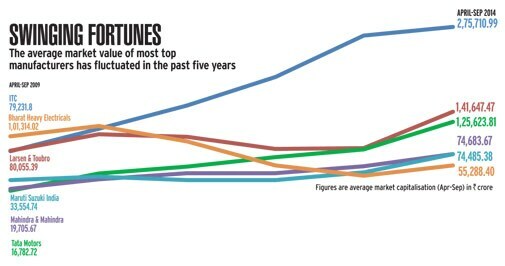 Growth in the market capitalisation of BT 500 companies has fluctuated over the past five years. 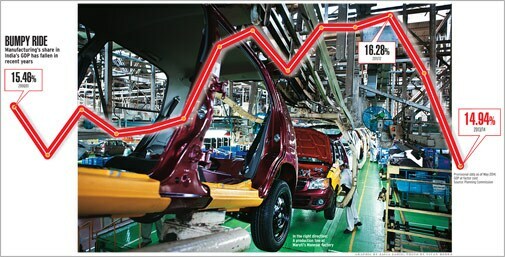 From 52.16 per cent in 2010, growth slumped to 13.66 per cent in 2011 and 5.20 per cent in 2012. It recovered to 13.14 per cent in 2013 and to 32.28 per cent this year. Also, the number of manufacturing companies in the BT 500 list shrank from 236 in 2009 to 202 in 2013, before recovering to 215 in 2014. This is not all. 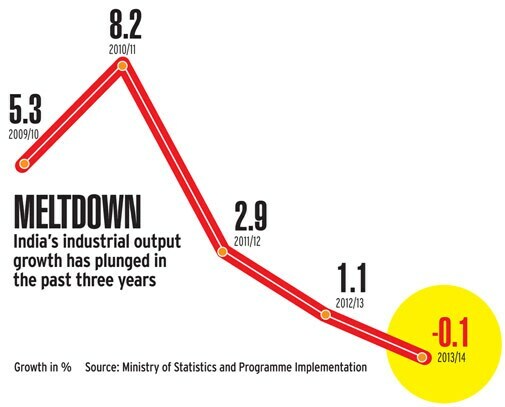 Manufacturing's share in the country's gross domestic product has fallen in recent years, from a high of 16.28 per cent in 2011/12 to 14.94 per cent in 2013/14. And latest data continues to indicate a slowdown - manufacturing output fell 1.4 per cent in August from a year earlier because of a lack of new orders. In a quarterly survey in August, industry lobby FICCI said 71 per cent manufacturing units didn't have plans for capacity addition for next six months with capacity utilisation remaining stagnant thus far. More than 64 per cent said they may not hire additional workforce in next three months, according to the survey. It is in this context that Prime Minister Narendra Modi's high decibel 'Make In India' campaign is so refreshing to many industrialists. On September 25, he unveiled the campaign's logo - a striding lion made of cog-wheels - and promised manufacturers "effective governance", not just "good governance". The campaign has three pillars: making it easier to do business by removing licensing and regulatory hurdles, enabling infrastructure such as industrial corridors, and opening up foreign direct investment in a number of sectors including defence, construction and railways. The National Manufacturing Policy aims to create 100 million jobs by 2022 and increase the share of manufacturing in India's GDP to 25 per cent. Still, investors, like the FICCI survey hinted, remain cautious and are on a wait-and-watch mode. Modi is going in the right direction, they say, but they want more than just assurances. For 'Make in India' to succeed, the government needs to address the concerns of three sets of manufacturers - existing investors, those who want to expand in India, and foreign investors. Existing investors who have suffered setbacks because of recent court rulings need a high dose of the confidence opium. "The private sector in India feels highly insecure. The government is not consistent, (and) a lot of reversals take place," says Ravi Uppal, Managing Director and Group CEO of Jindal Steel & Power. "Today, people are questioning the validity of any document given by the government. It comes to saying that any document given by the government must be endorsed by the Comptroller and Auditor General of India, the Central Vigilance Commission, the Central Bureau of Investigation, and finally the Supreme Court before it becomes a valid document," he adds. The Supreme Court recently cancelled the permits of 214 coal blocks allocated without auction between 1993 and 2010 by various governments. Miners have time till March 31, 2015, to hand over the mines to the government. Jindal Steel is one such company caught between a rock and a hard place. "We employ 30,000 people in our mines. They will be laid off," says Uppal. The company will not just face disruptions in coal supply, but also has a total investment of `36,000 crore at stake. "The opportunity lost will be in terms of future investment," he says. The Modi government has to win back this fast receding investor confidence. "There needs to be consistency in government policy. There must be a legislation to say that when government decisions are made, they cannot be questioned. This kind of protection must be given," stresses Uppal. Existing investors in India also need protection against outdated labour laws. Labour unions inside factories have been resorting to strikes and sabotage to press for higher wages and reverse disciplinary measures. In 2012, automaker Maruti Suzuki's Manesar plant faced a nasty labour strife, culminating in a management representative being charred to death. Another case in point is Parle Products's Bangalore factory. The company applied for closure of the plant after it could function for just three and half months between 2011 and 2013. Workers had halted production after an employee was suspended for abusing a personnel officer. Toyota Kirloskar Motor faced similar problems this year. Between February 10 and March 15, the union at the carmaker led the disruption of shop-floor operations at its factory near Bangalore 32 times, resulting in a production loss of 1,988 vehicles, which led the company to declare a lockout. The lockout was subsequently lifted and management was eventually able to enforce discipline. "We cannot allow a minority to hold the majority to ransom," says Shekar Viswanathan, Vice Chairman and Director at Toyota Kirloskar Motor. "The labour department has to play a keen and instructive role, fostering better relations with management. Labour is a state subject. Every chief minister, labour secretary and junior functionary in the department must say we cannot compromise on discipline. It is management's right to enforce it," he adds. 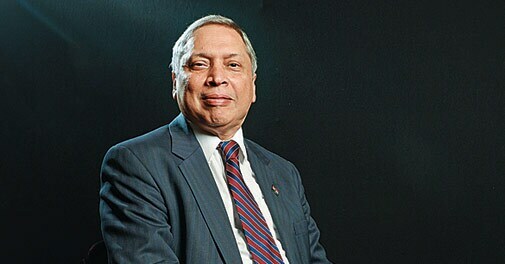 Labour reform, agrees Surinder Kapur, Chairman of auto parts maker Sona Group, is needed to improve India's competitiveness. He says workforce in India is not disciplined enough. "In most factories, people are not working for eight hours. It varies from five to seven hours," he says. India's output per worker, at $3,067 in 2013, is nearly half of China's, according to the International Labour Organization. In particular, industry groups and companies have been lobbying for a change in the Industrial Disputes Act, 1947. The Act mandates companies employing 100 or more workers to seek prior permission of the government for firing workers. Chapter V B of the Act bars companies from shutting shop or downsizing quickly - a company needs to seek permission from the government three months in advance. This locks up capital in unproductive assets. "Small and medium enterprises need to be given a holiday from labour laws for the next seven years, " says Kapur. "That's the kind of impetus you need." A small start has already been made in this direction. On October 16, Prime Minister Narendra Modi launched five initiatives under a new scheme titled Pandit Deendayal Upadhyay Shramev Jayate Karyakram to address some of these problems. The initiatives include simplifying compliance of 16 labour laws through a single online form and a transparent Labour Inspection Scheme aimed at ending undue harassment by factory inspectors. Anyone, say manufacturers, can delay projects in India. In his Delhi office, replete with horse sketches, Puneet Dalmia narrates a tale of how a non-governmental organisation (NGO) threw a spanner in the works two years ago. The Managing Director of Dalmia Bharat Cement recalls that, at one of the company's greenfield projects, a local NGO claimed the road connecting its plant to the main road was in forest land. The company was dumbstruck because there was no forest there. But the NGO argued the region was an elephant track. "As a solution, the NGO wanted funding for elephant conservation. They came up with a `4 crore budget, saying they need to buy jeeps and laptops," says Dalmia. The company did not pay up but created an underpass for the animals to cross, if at all. Often, projects get delayed also because some land owners don't want to sell their plots. "You may need to do 1,500 transactions to complete the entire land purchase since land holdings are small in India. You don't get contiguous land," says Dalmia. "There are patches that remain unsold. If you are stuck because of a small plot, you pay a hefty price. Then others who sold land a year back also come back to negotiate. This has happened many a time." In the company's project costs, the maximum inflation has been in the price of land - 20 to 35 per cent a year across states. Dalmia Bharat Cement has operations in 14 states. Other manufacturers face similar problems in land acquisition, which could lead to changes in business plans. German agro-equipment maker Lemken wanted to set up a plant in Pune in 2008 and was hunting for 20,000 square meters of land as the city had good infrastructure and skilled manpower, says CEO Arvind Kumar. But the company couldn't find a plot of land and finally went to Nagpur to set up the factory. All these come at a time when foreign countries are aggressively looking to generate employment and are eyeing Indian investment. Apollo Tyres, for instance, is setting up a factory in Hungary that would employ 900. "We were chased by a number of countries - Slovakia, Poland, Hungary," says Onkar Kanwar, Chairman and Managing Director of Apollo Tyres. "We selected Hungary because our belief has been always to have a plant close to facilities where you know people can live and work properly. It's a one-and-a-half hour drive from Budapest." Kanwar is hesitant to link his expansion in Europe to the difficulty of getting things done in India but says land prices in India have become exorbitant. "Where we used to pay `10 lakh an acre, the same land is available for `1 crore now," he adds. Adi Godrej, Chairman of the Godrej Group, points to a "funny law" that prohibits development of land under the Coastal Regulation Zones. "All coastal cities are badly affected by this - no other country in the world has such a law. Things like land reclamation is becoming difficult in India... All these come in the way of manufacturing development," he says. Doing business has become tougher in the past few years, he adds. Too many permissions are required from too many agencies, and there are delays in environment clearances and land acquisition. To set up a cement plant, for instance, it takes 43 clearances from different agencies. "It becomes extremely complicated," says Godrej. SO WHAT CAN MODI DO? Godrej's solution - minimal permissions from the government, be it the state or the centre. "The government should have an adequate land bank. Simplification is the key to getting it done. The law of the land should be that if a certain permission is not granted within a certain period, say three months, then it is assumed to have been granted," he suggests. Intricately linked to the high cost of land and the complexity of operating in India is the high cost of financing a project. Manufacturers want the government to relax lending norms. For instance, a steel plant of one million tonnes costs $1 billion and banks require promoter equity of 25 per cent for lending. "The promoter must have $250 million. 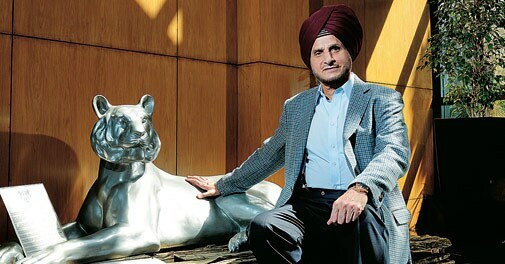 Not many people have that kind of cash," says Uppal of Jindal Steel. "The government should have a guideline that says banks can go up to 90 per cent lending." Most domestic banks, laden with bad loans, may not agree with Uppal. But in many countries lending norms are easier and interest rates lower than in India, which works to the advantage of multinational companies. Jindal Steel, for instance, has set up a two-million-tonne steel plant in Oman. "Banks gave us money with a smile with favourable terms. The cost of loan is six per cent. In dollar terms, the rate is less than five per cent. India is at 12 per cent," says Uppal. 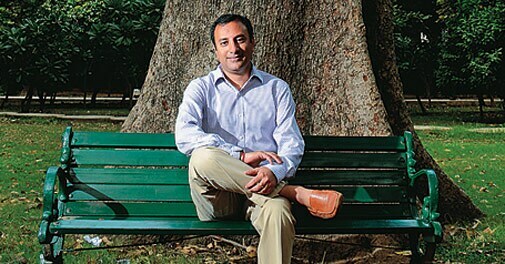 Smaller companies are being asked for personal guarantees by banks, says Kapur of Sona Group. "The stumbling block in automotive is that Tier-II and Tier-III suppliers are not growing at the pace they should because they are not being funded by banks. If suppliers don't grow, the alternative would be imports to overcome shortage. There is a cost to it," he adds. His company is taking vendors to banks, explaining to bankers that they need loans to operate. S.V. Sukumar, Partner and Head of Strategy and Operations Practice at KPMG in India, says India must also ensure protection of intellectual property rights to boost manufacturing. "If high-end manufacturing comes to India, design will too. There must be protection for multinational companies R&D," he says. Foreign direct investors don't face a cash crunch. They have other headaches. Over the past few years, Indias income tax department has slapped tax evasion notices against multinationals ranging from Vodafone and Nokia to Shell India and General Electric. "Tax terrorism", a term that gained popularity in the run-up to general elections this year, includes retrospective taxation and claims on withholding tax. Both have earned India a bad name. In 2012, the Congress-led United Progressive Alliance government amended a law to retrospectively tax deals between any two companies if the underlying assets were in India, affecting mobile-phone operator Vodafone that had bought Hong Kong-based Hutchison Group's stake in Hutchison Essar. Similarly, Nokia has been slapped with two tax cases totalling `17,658 crore, and the implication has been disastrous for Indian manufacturing, employees and a growing electronic assembly ecosystem in Chennai. Nokia's Sriperumbudur factory, once the world's largest mobile-phone plant with 8,000 permanent employees producing 15 million handsets a month, will down shutters on November 1. In February this year, the Tamil Nadu Sales Tax department slapped a tax case accusing Nokia of not having exported any of the mobile phones it manufactured at the plant between 2009 and 2011. "We find this claim surprising since we have customs documentation showing we exported more than 400 million phones during that period," a Nokia spokesperson had told Business Today earlier. The second dispute relates to withholding tax. The Income Tax Department claimed `15,258 crore in unpaid taxes, interest and penalties as Nokia India showed the payments made for buying software from its head office in Finland as 'purchase transactions', not 'royalty payments'. While tax experts, such as Sanjay Sanghvi, Tax Partner at Khaitan & Co, say there was no tax liability in a purchase transaction concluded outside the country, authorities treated Nokia as a defaulter. Authorities also froze the company's manufacturing assets, preventing a transfer to Microsoft, which announced acquisition of Nokia's devices and services business in 2013. Nokia let go most of its employees and the plant became a contract manufacturer for Microsoft. The US-based company recently informed the handset maker it will terminate their manufacturing services pact from November 1, prompting Nokia to suspend production at the plant. Brett Young, a corporate communications executive at Nokia Corporation, told BT the asset freeze by the tax department prevents the handset maker from exploring potential opportunities to sell the factory to any other company. "Nokia is now evaluating options to minimize the impact on the over 1,100 employees remaining at the manufacturing facility," he said in an e-mailed response. To attract investments, said Young, India should up set fast-tracks courts to resolve disputes and end practices that do more harm than good to all stakeholders - asset freezes being one example. "It is also critical to quickly resolve existing tax disputes sparked by retrospective taxation policy shifts. Companies that have operated with the same business model for many years, and have been regularly assessed and audited by the tax authorities, should be able to expect a reliable and consistent business environment," Young said. But until India creates such an environment, manufacturing will resemble a lamb - not a lion. There is much work to be done before the cogs start to turn.